Adding 3D text to your sketchup models can help add a level of detail that will bring your models up to the next level. Because text is full of weird shapes and curves, it can be a pain to get what your looking for. So let’s break it down. If you’d like to center your text on something, go into the group and draw a rectangle around the extents of your text. Snap the middle of your rectangle to the middle of the edge you’d like to center on. 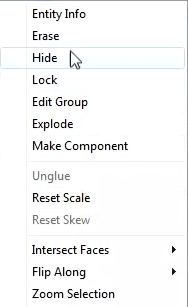 Right click on your rectangle and hit Hide to hide it. If you need to rotate to a particular face or axis, get the rotate tool on the right access on any face and hold shift to lock to that axis. If you need to move along a particular axis or edge, select it, and hold shift. Hope this helps! Let me know below if you have any questions with creating 3d text. Also feel free to share any images showing how you used 3D text to really level up your design!